More rock and mud on Tuesday fell at the site of a major landslide that buried a mountain village and scores of people in southwest China last weekend, state media said. No one was injured in the new and smaller avalanche as the area where Xinmo village once stood had been cordoned off following warnings on Monday, Xinhua news agency reported. Rescuers workers who had been digging through the rubble since Saturday’s disaster were evacuated from the area on Monday in anticipation of another slide. 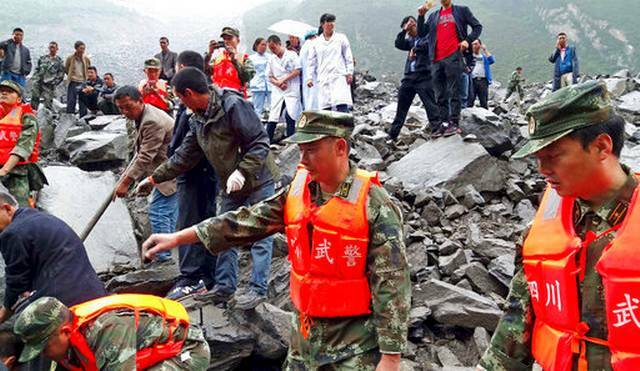 At least 10 people have been confirmed dead and 93 are still missing after heavy rain brought down the side of a mountain onto the village in Sichuan province. Only three survivors have been found.